In addition to extensive territory around and beyond the Baltic, Sweden possessed overseas colonies from 1638 to 1663, and from 1784 to 1878, mainly in North America and Africa, selling or losing its territory to the Netherlands, France, and Great Britain. Chartered trading companies played an important role in acquiring and settling overseas colonies. From the end of the Napoleonic Wars, Sweden adopted a policy of neutrality. This, together with the fact that Sweden never fought against independence movements in the colonial space, contributed towards Sweden's transformation from a military power of considerable significance into a nation committed to global peace and security. Although her colonial history is much less recent than that of other former imperial powers, its legacy arguably opened Swedes up to the world beyond Europe. As a modern day supporter of the peace keeping activities of the United Nations and a major donor in the fields of aid and development, Sweden is committed to achieving an equitable and just world for all its people. Sweden does not possess residual ties with former colonies that influence its foreign policy or involve ongoing commercial or economic interests. Consequently, it has adopted an aid policy based on recipient needs rather than on donor interests. That Sweden possessed a colonial empire is a less well known fact than that Spain, Great Britain, France, or Holland had their extensive imperial projects. This is due to the fact that the Swedish colonies were fewer and smaller than were those of other powers. As a state that played a significant role in Europe, with a history of sea-faring, Sweden, as did other European nations, wanted trading partners, sources of raw material, and outlets for its own products. At times in her history, Sweden had ruled or was united with Norway and governed a land-based empire in the Baltic including Finland, Estonia, and parts of Russia, Poland, Latvia, and Germany. Sweden-Norway in fact was ahead of such nations as Germany and Italy in acquiring overseas colonies. Sweden was allied with Napoleon Bonaparte's enemies during the Napoleonic Wars in Europe, which was the last major conflict in which Sweden took part before adopting a policy of neutrality. Sweden-Norway united (1814-1905) took part in the Berlin Conference (1884) which divided Africa between the major powers, although Sweden was not included in the distribution of territory. Sweden's land-based empire in 1658. Sweden's population doubled during the hundred years period from the mid seventeenth to the mid eighteenth centuries, when industrialization also began. Population growth and industrialization contributed to Sweden's desire to join the scramble for colonies. Another contributing factor was the result of the war fought with Russia between 1700-21, which left Sweden short of funds. Trade offered a way to replenish the Treasury. In addition to trading companies formed to pursue commerce and exploration in Africa and in the Americas, the Swedish East India Company was established in 1731. Its ships traded with China, making a total of 132 expeditions, although the company encountered opposition from the British and Dutch, who regarded trading in the East as their exclusive right. The first expedition was detained by the Dutch in Indonesia on its return, who refused to recognize that it had a right to carry the Swedish flag. Fort Batenstein, present Butri: 1649-1656. Fort Witsen, present Takoradi: 1653-1658. By the middle of the seventeenth century, the Swedish Empire had reached its greatest territorial extent. The Swedes sought to extend their influence by creating an agricultural (tobacco) and fur trading colony to bypass French, British, and Dutch merchants. They therefore formed the New Sweden Company to promote this agenda. The charter included Swedish, Dutch, and German stockholders. Once they landed in the Americas (in 1637), they established Fort Christina (now Wilmington, Delaware), named after Queen Christina of Sweden. Many of the settlers were Finnish; since until 1809, Finland was governed as the eastern third of the kingdom of Sweden. New Sweden in relation to New Netherland. 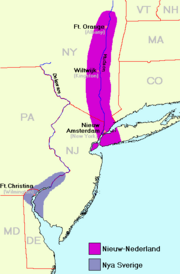 The settlement became known as New Sweden and was actually an invasion of New Netherland, since it was Dutch territory. The first governor, Peter Minuit, died after returning from Stockholm, by a hurricane, while on the island of St. Christopher in the Caribbean. The colony would establish Fort Nya Elfsborg north of present-day Salem, New Jersey, in 1643. In 1643, the company expanded along the river from Fort Christina, and established Fort Nya Elfsborg on the south bank near present-day Salem, New Jersey. In 1644, New Sweden supported the Susquehannocks in their victory in a war against the English Province of Maryland. In May 1654, the Dutch Fort Casimir was captured by soldiers from the New Sweden colony led by governor Johan Rising. The fort was taken without a fight because its garrison had no gunpowder, and the fort was renamed Fort Trinity. As reprisal, the Dutch—led by governor Peter Stuyvesant—moved an army to the Delaware River in the late summer of 1655, leading to the immediate surrender of Fort Trinity and Fort Christina. The Swedish and Finnish settlers continued to enjoy a degree of local autonomy, having their own militia, religion, court, and lands. This status lasted officially until the English conquest of the New Netherland colony was launched on June 24, 1664, when the Duke of York sold the area that is today New Jersey to John Berkeley and George Carteret for a proprietary colony, separate from the projected New York. The actual invasion started on August 29, 1664, with the capture of New Amsterdam. The invasion continued, and was concluded with the capture of Fort Casimir (New Castle, Delaware) in October 1664. The invasion was one of the things that was contested in the start of the Second Anglo-Dutch War. The status continued unofficially until the area was included in William Penn's charter for Pennsylvania, on August 24, 1682. During this later period some immigration and expansion continued. The first settlement and Fort Wicaco were built on the present site of Philadelphia in 1669. 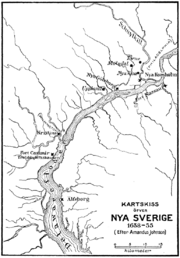 The historian H. Arnold Barton has suggested that the greatest significance of New Sweden was the strong and long-lasting interest in North America that the colony generated in Sweden. America was seen as the standard-bearer of enlightenment and freedom, and became the ideal of liberal Swedes. Admiration for America was combined with the notion of a past Swedish Golden Age, whose ancient Nordic ideals had supposedly been corrupted by foreign influences. Recovering the purity of these timeless values in the New World was a fundamental theme of Swedish, and later Swedish-American, discussion of America. Since the imaginary Golden Age answered to shifting needs and ideals, the "timeless values" varied over time, and so did the Swedish idea of the new land. In the seventeenth and eighteenth centuries, North America stood for the rights of conscience and religious freedom. In the political turmoil of nineteenth century Europe, the focus of interest shifted to American respect for honest toil and to the virtues of republican government. In the early twentieth century, the Swedish-American dream even embraced the welfare state ideal of a society responsible for the well-being of all its citizens. By contrast, America became later in the twentieth century the symbol and dream of ultimate individualism. Major Swedish immigration to the United States did not occur until the late nineteenth century. From 1870-1910, over one million Swedes arrived, settling particularly in Minnesota and other states of the Upper Midwest. With the exceptions of Germany, Ireland, and Norway, no other European country has had a higher percentage of its population move to North America. Traces of New Sweden persist in the Delaware Valley to this day, including Holy Trinity Church in Wilmington, Gloria Dei Church in Philadelphia, and Trinity Episcopal Church in Swedesboro, New Jersey, all commonly known as "Old Swedes' Church." Vassberg's study of a Swedish farming community in Texas shows how many aspects of Swedish identity and culture were preserved well into the twentieth century. As a result of Sweden's support of France's enemies during the Napoleonic Wars, the island of Guadeloupe was ceded to king Charles XIV John personally, not to his Swedish state. However a year later the island was given to France by the Treaty of Paris. Sweden then forced a settlement with Great Britain because it had been guaranteed the island which was strategically close to its other Caribbean colony. This led to the Guadeloupe Fund which guaranteed Sweden 24 million francs. Because of how the money was used, Sweden was then given an additional 300,000 Riksdaler under the Riksdag of 1815 every year. The last installment was paid in 1983. Sweden temporarily controlled several settlements on the Gold Coast (present Ghana) since 22 April 1650, but lost the last when on April 20, 1663, Fort Carlsborg and the capital Fort Chistiansborg were seized by Denmark. Another trading company with a royal charter was responsible for pursuing Sweden's interests in Africa, the Swedish Africa Company (founded in 1649). In 1650, an expedition under the command of Henrik Carloff was send to Africa. Carloff made a treaty with the King of Futu (also Feta) on selling some areas of land. On April 22, 1650, the Swedish Gold Coast was founded and Carloff became its first administrator. In 1656, Johan Filip von Krusenstierna (brother of the great-grandfather of the famous admiral and explorer Adam Johann von Krusenstern) was appointed the new Governor. This enraged Carloff. He left Cabo Corso only to return on January 27, 1658, on the Danish Privateer "Glückstadt." Fort Carlsborg was seized and made part of the Danish Gold Coast colony. King Charles X Gustav of Sweden made this one of his reasons to go to war with Denmark. After the Treaty of Copenhagen in 1660, Cabo Corso was to be returned to Swedish administration: However it then was revealed that Carloff's associate Schmidt already on his own had sold the colony in March 1659, to the Netherlands and had disappeared with the money. Later, the local population started a successful uprising against their new masters and in December 1660, the King of Futu again offered Sweden to take control over the area. A new expedition was send to the colony which remained under Swedish administration only for a short period. von Krusenstierna was reappointed as administrator. On April 20, 1663, Fort Carlsborg and the capital Fort Christiansborg again were seized by the Dutch after a long defense under the Swedish commander Tönnies Voss. On May 9, 1664, the area again was seized, this time by the British who made it part of the British Gold Coast colony. In 1652, the Swedes took Cape Coast (in modern Ghana) which had previously been under the control of the Dutch and before that the Portuguese. Cape Coast was centered around the Carolusburg Castle which was built in 1653, and named after king Charles X Gustav of Sweden but is now known as the Cape Coast Castle. During this time, the small Swedish slave trade began. However, after the fall of New Sweden to the Dutch, the slave trade ended. It would later be rejuvenated under Gustav III who would founded a Swedish colony on Saint-Barthélemy in 1785, and made the island a center for slave trading. The Swedish West India Company was established on the island in 1786. The fact that Sweden lost its colonies before anti-colonial, freedom movements began means that the decolonization process and many of the consequences of this that other colonial nations experienced, such as fighting protracted and expensive wars, did not apply. Sweden's switch to a neutral position in the early eighteenth century made Sweden an inviting place for people fleeing war elsewhere, a safe haven for refugees. This switch from concern to be a military power to neutrality had consequences for the way in which Sweden viewed her role in the world. Instead of wanting to dominate the world as a great power, although this had certainly played a role in her earlier self-understanding, Sweden became more interested in spreading Enlightenment values. In the post-World War II context, in proportion to her Gross National Product, Sweden has been one of the highest contributors to aid and development. The legacy of the colonial empire left Sweden with knowledge of and interest in other parts of the world, which has translated into concern for issues of global justice and peace making Sweden one of the most active countries in supporting United Nations peace keeping activities. Swedes did not inherit the attitude from the colonial period that has complicated the way in which some former colonial powers view the rest of the world, as, despite the end of colonialism, a theater for the pursuit of their own interests and agendas. Nor has Sweden favored former colonial territories in its aid program, since links that did exist are too distant in time to have any continued claim. ↑ Government of Sweden, Sweden's policy for global development. Retrieved July 18, 2008. ↑ H. Arnold Barton, A Folk Divided: Homeland Swedes and Swedish Americans, 1840-1940 (Carbondale, IL: Southern Illinois University Press, 1994, ISBN 9780809319435), 5—7. ↑ David E. Vassberg, Stockholm on the Rio Grande: A Swedish Farming Colony on the Mesquite Frontier of Southernmost Texas (1912-1985) (Lanham, MD: University Press of America, 2003, ISBN 9780761825357). Barton, H. Arnold. A Folk Divided: Homeland Swedes and Swedish Americans, 1840-1940. Carbondale, IL: Southern Illinois University Press, 1994. ISBN 9780809319435. Hermansson, Robert. The Great East India Adventure: The Story of the Swedish East India Company. Göteborg, SE: Breakwater Publishing, 2004. ISBN 9789197520096. Lockhart, Paul Douglas. Sweden in the Seventeenth Century. European History in Perspective. Basingstoke, Hampshire, UK: Palgrave Macmillan, 2004. ISBN 9780333731567. Mattsson, Algot. New Sweden: The Dream of an Empire. Göteborg, SE: Tre Böker, 1987. ISBN 9789185414741. Ruhnbro, Rune, and Richard E. Fisher. New Sweden in the New World, 1638-1655: Visions of Greatness. Höganäs, SE: Wiken, 1988. ISBN 9789170244483. Vassberg, David E. Stockholm on the Rio Grande: A Swedish Farming Colony on the Mesquite Frontier of Southernmost Texas (1912-1985). Lanham, MD: University Press of America, 2003. ISBN 9780761825357. World Statesmen- Swedish Possessions & Colonies. The American Swedish Historical Museum - preserves the Swedish-American cultural legacy. History of "Swedish colonial empire"
This page was last modified on 9 November 2015, at 15:10.